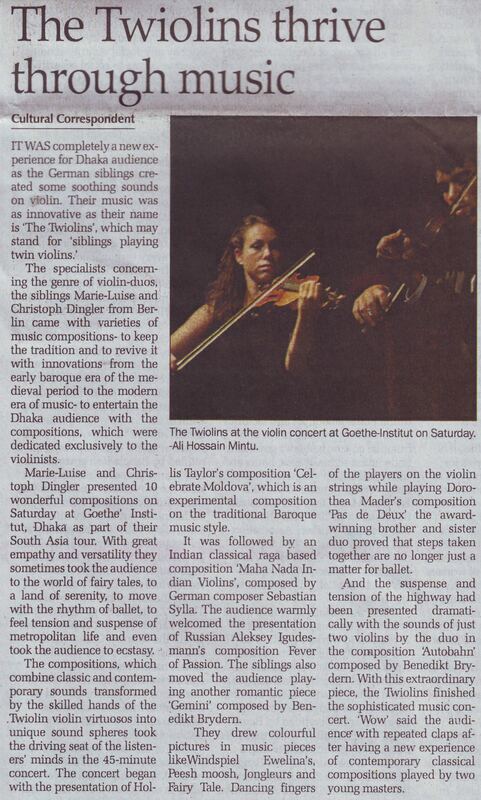 New Age, Dhaka, 8.10.2012 – Cultural Correspondent: It was completely a new experience for Dhaka audience as the German siblings created some soothing sounds on violin. Their music was as innovative as their name is ‚The Twiolins‘, which may stand for ‚siblings playing twin violins‘. The specialists concernig the genre of violin-duos, the siblings Marie-Luise and Christoph Dingler from Berlin came with varieties of music compositions- to keep the tradition and to revive it with innovations from the early baroque era of the medieval period to the modern era of music- to entertain the Dhaka audience with the compositions, which were dedicated exclusively to the violinists. Marie-Luise and Christoph Dingler presented 10 wonderful compositions on Saturday at Goethe ́ Institut, Dhaka as part of ther South Asia tour. With great emphaty and versatility they sometimes took the audience to the world of fairy tales, to a land of serenity, to move with rhythm of ballet, to feel tension and suspense of metropolitan life and even took the audience to ecstasy. The compositions, which combine classic and contemporary sounds transformed by the skilled hands of the Twiolin violin virtuoses into unique sound spheres took the driving seat of the listeners ́ minds in the 45-minute concert. The concert began with the presentation of Hollis Taylor ́s composition ‚Celebrate Moldova‘, which is an experimental composition on the traditional Baroque music style. It was followed by an Indian classical raga based composition ‚Maha Nada Indian Violins‘, composed by Germany composer Sebastian Sylla. The audience warmly welcomed the presentation of Russian Aleksey Igudesman ́s composition Fever of Passion. The siblings also moved the audience playing another romantic piece ‚Gemini‘ composed by Benedikt Brydern. They drew colourful pictures in music pieces like Windspiel, Peesh moosh, Jongleurs and Fairy Tale. Dancing fingers of the players in the violin strings while playing Dorothea Mader ́s ‚Pas de Deux‘ the award winning brother and sister duo proved that steps taken together are no longer just a matter of ballet.